Last weekend the Russia 2018 World Cup was the priority as the club teams gave way to the national sides fighting for a place in this big event. England are unbeaten at the moment and, after a disappointing display in the Euro, may be starting to up their game again, even if their qualifying group is one of the easiest. 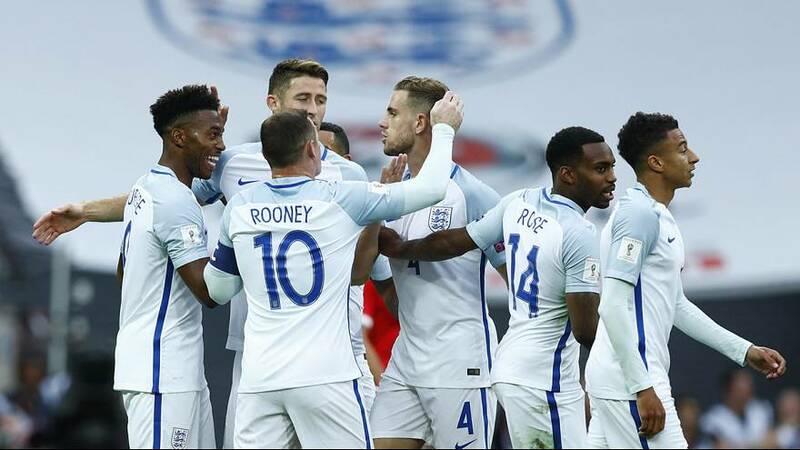 Goals from Daniel Sturridge and Dele Alli saw off FIFA’s 176nd-ranked side as Malta just looked to not lose too heavily and posed no threat to England. Manager Gareth Southgate has just four games in charge until the FA has to make a decision about a permanent replacement for Sam Allardyce, and while the win maintains England’s 100% qualifying record, the team still obstinately refuses to dazzle. So the win will be gratefully pocketed, but no-one is breaking out the champagne yet. The next game against Slovenia will be a much sterner test. Today in Up & Down we talk about the man responsible for this improvement and about two players that are at opposite ends of their careers. England’s reluctant manager only has the job in a caretaker capacity. As a player Southgate played 57 times for England, and as manager of the under-21 side he had an 80% win record. The senior side would love that. The young lad from Warrington’s done good. Now a regular starter for Manchester United he now has his first England cap and impressed against Malta, even if the meagre two-nil scoreline against a nation with roughly the population of Bristol isn’t much to shout about. England’s most-capped outfield player and record goalscorer got the bird from sections of the crowd at Wembley towards the end of the game. Down on speed and touch, the team captain has scored just once in his last seven internationals. He may start from the bench against Slovenia. As we just saw Wayne Rooney is not having the best of times lately. After the match Gareth Southgate raised his voice in defence of the captain and reminded everyone what he’s done for England. Let’s see what the coach said. “The criticism of him is, at times, unfair. And he ploughs on and plays with pride and captains his country with pride. I always think…I look back to the John Terrys, the Frank Lampards, the Ashley Coles…in their time with England they took an enormous amount of criticism and yet, when you look at the number of caps they got, they were the guys that kept turning out and they were the ones that really put themselves on the line. Whereas some other players have not put themselves forward in those moments, and withdrawn from squads when the going’s got tough. Those guys are the people that have really desperately wanted to play for England again and again and again, and put their neck on the block. And I think Wayne falls into that category,” said Southgate. The road to Russia 2018 continues this week. These are the predictions of euronews’ sport team for some of the upcoming matches. Join us using the hashtag #thecornerscores. We finish today’s program with one of the more bizarre incidents to ever occur on a football pitch. Enner Valencia said he was injured during a match between Chile and Ecuador so he headed off in an ambulance for an early bath. But was it just a ruse to escape policemen waiting for the end of the game to arrest him for unpaid child support? Comic scenes ensued as police officers chased the ambulance. In any case he will be playing again on Wednesday. “The Corner” is definitely not crocked, and will be back next Monday.